Everything colourful and creative has always attracted my interest. And painting on paper or canvas has been a long time hobby. However, paintings can only be hung on walls and I can’t carry them around. And I wanted a way to have art move around with me as a part of me, my personality and who I am. And then I decided to paint my jeans. I loved them so much that I worried wearing them, fearing to wear them off. Only recently did I come to terms with my accompanying art piece, my pair of jeans and started wearing them more often. I decided to paint more for myself as well as share my love for art with others. I decided to open my shop at Etsy and offer everyone a piece of art to walk around with. Whether a pair of denim, skirt, jacket, a handbag or shoes or any other accessory, irrespective of the age and gender of the wearer, I decided to leave a piece of unique art on each. So for your love of arts, fashion and your need to express yourself with colours and unique, one of a kind creation, please check out my collection. AlbertaCurves is founded for the very reason to satisfy wishes of everyone who would love to wear art on them. And, I can’t stop painting on Canvas hence I will keep adding some art to add to your walls too. Don’t forget to sign up for our Newsletter to stay updated with our new products and some great discounts! Author vatsalasinhaPosted on October 29, 2017 October 29, 2017 Categories Art, Fashion, Hand painted, Handmade, UncategorizedTags #AlbertaCurves, #beauty, #blogger, #fashion, #fashionblogger, #Life, #photos, Art, Canvas shoes, christmas gift, christmas gift ideas, custom, DIY, fashion tips, gift ideas, hand crafted, Hand painted, hand painted canvas shoes, hand painted denim, hand painted handbags, hand painted jeans, handpainted baseball cap, Jeans, lifestyle, shoe, shoes, shopping, Skirt, style inspirationLeave a comment on How did AlbertaCurves start? 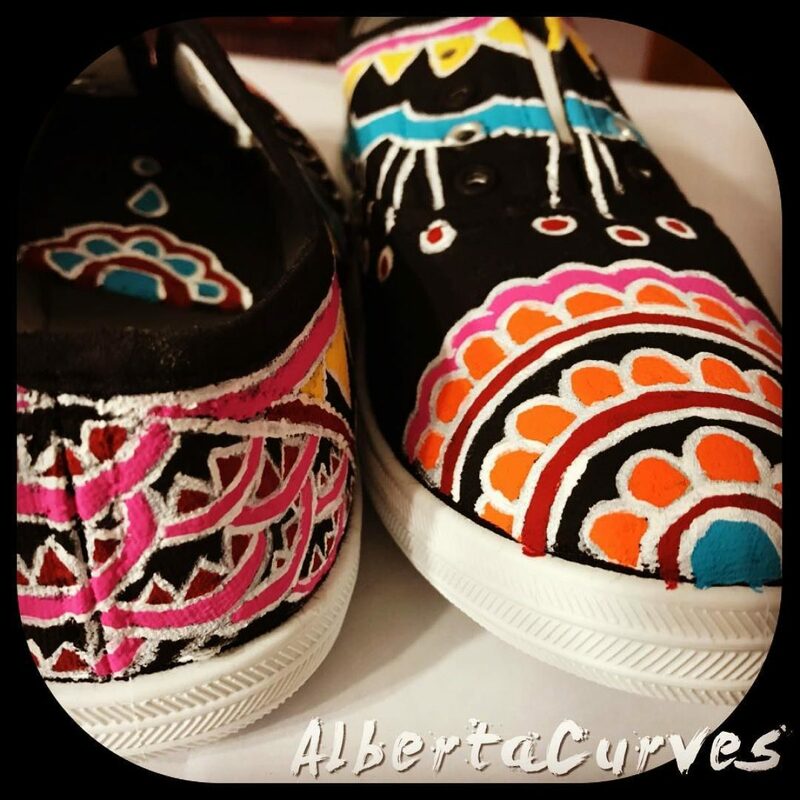 AlbertaCurves is an Edmonton based company providing custom hand paintings on your choice of denim. All patterns are my own designs and can be further customized. They are inspired by various art forms like Henna, Madhubani art, Warli art, Indian and modern art forms. They can be painted on Denim pants, shorts, skirts or jackets. They are all sketch based designs wherein I prefer to use either black or white for outlining, depending upon the denim colour. Further, bright colours can be added to accentuate the patterns or one could choose to have monocoloured designs. One can wash the finished product with the fabric turned inside out, in cold, delicate wash cycle, or simply hand wash them. On my Etsy shop, I have included various sketches of patterns that I can further customize in hundreds of ways and can be painted on Jeans pants, skirts, shorts and jackets. If you would like to get updates on new designs, sales, and discount coupons, then please feel free to sign up for AlbertaCurves‘ Newsletters. I promise you to not bother you with unnecessary emails, but only send Newsletters to offer the best discounts and new products. So, sign up now to get 30% discount on your next pair of custom hand painted Jeans.